The Washington Capitals, in coach Barry Trotz's words, had been "kicking around for quite a while" the idea of giving goaltender Philipp Grubauer a spot start in the NHL. It was a matter of perusing the schedule and finding the most opportune time. Once the March 2 trade deadline passes, teams are only allowed four non-emergency recalls, so the Capitals didn't want to waste one simply to evaluate Grubauer's progress, so it had to come before. They ultimately circled Friday, figuring that the second half of a back-to-back against a Western Conference opponent was the most conducive setting for examining Grubauer. Grubauer, whose stout play for the Hershey Bears this season earned him an AHL All-Star selection, faced a formidable test against the league-leading Anaheim Ducks, though that would do little to intimidate him. After all, this was the same rookie that outdueled New York Rangers goaltender Henrik Lundqvist at Madison Square Garden in his first NHL victory in December 2013. In his impromptu start, Grubauer performed well in Washington's 3-2 shootout victory, making 23 saves and reaffirming the Capitals' faith in him and his ongoing development. 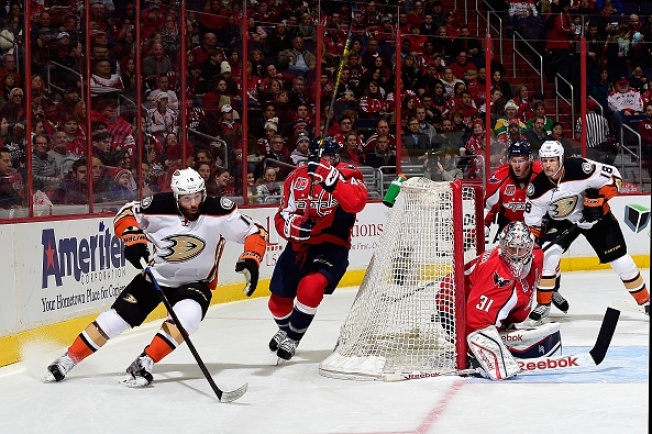 "Every experience that you have is really good," Trotz said. "You get to see him athletically, how he plays, is he intimidated by the big spotlight, those types of things. Those are good indicators. With the exception of Corey Perry's third-period goal, which banked in off Grubauer's left skate because he failed to cover the near post, there was little to criticize. Grubauer only faced 25 shots, a stark contrast to his workload in 14 starts for Washington last season. "I think it's a little more compact," Grubauer said, describing the differences in how the Capitals play under Trotz as opposed to former coach Adam Oates. "Guys do a pretty good job in the [defensive] zone and keeping shots to the outside. I think we don't give up as many high-quality chances as we did last year." Grubauer then packed, preparing for a return to Hershey with the souvenir of another NHL victory to take back with him. A start for the Bears could await him Saturday. Last summer, Washington signed Justin Peters, who Grubauer nudged out of the lineup Friday, so that Grubauer could receive unimpeded playing time. Still, the Capitals wanted to see what they had and were pleased with their findings.